Maps and page images from South Wales and the Wye District of Monmouthshire (1892) in the Bartholomew Thorough Guide Series, edited by C. S. Ward, M.A. and M. J. Baddeley, B.A.—I have the third edition of this little guide book for tourists, which is small enough to fit into a suit jacket pocket. Author: Ward, C. S. and Baddeley, B. 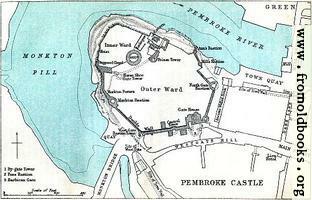 A.
Map: River Wye, Chepstow, etc.